Epoxy is super tough stuff. It’s a quick and easy way to make any garage floor twice as hard as concrete with an afternoon of work. It’s a wonder material that has transformed the way we think about flooring and durability. However, this is no epoxy. Rust-Oleum is one of the biggest brands in the world when it comes to floor coatings. They are always innovating and changing the game (and are always upping the stakes for the competition). This product is a perfect example of that. 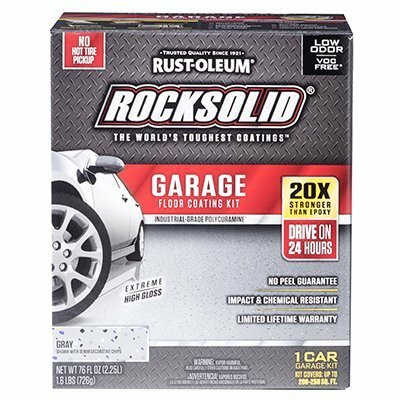 Find out why in our Rust Oleum Rocksolid review. 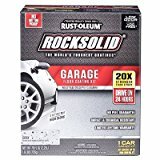 But this is Rust-Oleum we are talking about here. They state that this floor coating (which is made from Polycuramine) is 20 times stronger than epoxy (that’s not a typo). Considering that epoxy is already twice as strong as concrete, that’s quite a statement! It’s basically impossible to damage this flooring without intentionally trying (and without some serious hardware). It’s super resistant to hot tires, chemical spills, oil spills, heat, cold, water, and everything else you would commonly find in a garage. It will literally last you a lifetime and will look as good as new for decades to come. This is a stunningly beautiful floor coating considering its strength. It’s available in a classic gray smoke color that makes your floor look fresh and clean from the moment of application. The high gloss shine is simply gorgeous and gives a wet look appearance even after years of use. Rust-Oleum gives you enough flakes in the box to go a little crazy with them if you really want to. Don’t feel like you need to use the entire packet, and go slowly if you don’t want to over do it. Despite what Rust-Oleum claim, this is actually a tricky floor coating to apply properly. If it’s not done precisely as intended (with the right temperature/humidity) then the curing process is disrupted. If this happens it actually makes the product weaker than epoxy and is something that needs to be avoided at all costs. That being said, if you follow the instructions very carefully and pick the right day for the application – it’s not exactly rocket science. You don’t need previous experience to do a good job and the actual application of the coating is no harder than normal epoxy. It’s just the timing and environmental conditions that need to be taken into account to receive Polycuramine’s full strength. 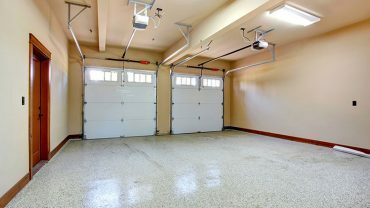 However, once you have laid down the flooring you won’t have to wait long before you can use your garage. This stuff dries much quicker than epoxy, you will be able to walk on your floor after 8 hours and drive a truck over it in 24 hours. If you feel like you are able to provide the right temperature and humidity required for this epoxy during application, then this is a great product. Its strength so immense it’s a little hard to comprehend. When this durability is combined with the reasonable price tag and the stunning glossy gray finish – it’s easy to see why it’s so popular.